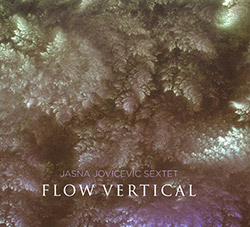 This is a wonderfully eclectic and exploratory set of compositions/improvisations by saxophonist and composer, Jasna Jovicevic. Hailing from Serbia, Jovicevic is equally interested in Yoga as well as music, and the relationship between the being and musical sound and "its direct on our body, mind, and energy". She is well travelled and highly educated having received her BA from Franc Liszt Music Academy in Budapest, Hungary, and MA in composition from York University in Toronto. The music presented in this release is a far cry from the usual jazz sextet instrumentation, but Jasna's deployment of the chosen instruments is quite stunning and ultimately effective. Opening with the slightly disturbing groove orientated and bass register driven 'Rising Barefoot Over Battle' to the lighter sounds and mood of 'Drifting Upstream', Jovicevic immediately displays her compositional prowess, and skill in arranging for the sextet with some scintillating interplay between bassoon and bass clarinet. This is again demonstrated in the dramatic use of strings on 'Offering Tears For Pearls' with some wonderful writing that draws on pure lyricism and clever use of dynamics. Tension is built on 'Speak Loud, My Inner Child' with Jasna's tenor saxophone playing moving from the graceful lyrical opening to a tougher edged melodic development into freer territory using split tones and multiphonics before again bringing us back to calmer waters. By contrast, 'Fairy With The Dense Green Eye' introduce a carefully paced use of texture and rhythm with Jovicevic's pure toned soprano lines building in intensity. Soprano saxophone is again to the fore on the closing 'Silver Wings Of A Thousand Petals', a piece that morphs into a superb duet between saxophone and cello. All in all this is a most satisfying album that has plenty of interest melodically, rhythmically and in the wonderful arrangements that Jasna creates for the sextet.